This program was originally an ebook. The book describes how college game is different to other situations and gives you a different strategy targeted at the college environment. 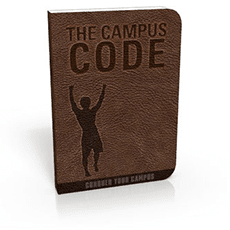 In August 2013 the program was renamed to "The Campus Code" and was upgraded. You will be charged $19.97 if you choose to continue after the trial (Big Men on Campus). It's not bad, but it's nothing groundbreaking. Essentially it's about how to be a leader in a social circle. It also talks about giving value to people around you.